Users ranked 1970 Dodge Challenger against other cars which they drove/owned. Each ranking was based on 9 categories. Here is the summary of top rankings. Have you driven a 1970 Dodge Challenger? Displaying 1 - 10 of 14 1970 Dodge Challenger reviews. More refined styling than the Cuda. 340 engine best choice. Power Ranked 1970 Plymouth Barracuda better. "Same 198,225,318,340,383,426 and 440 engines for both E-bodies." Handling Ranked 1970 Plymouth Barracuda better. Looks/Style Ranked 1970 Plymouth Barracuda better. Front Seats Ranked 1970 Plymouth Barracuda better. "Lots of legroom for driver and passenger." Back Seats Ranked 1970 Plymouth Barracuda better. Cargo Capacity Ranked 1970 Plymouth Barracuda better. Family Car Ranked 1970 Plymouth Barracuda better. "Family of TWO!! No room in the back,your six year old will complain!!" Value Ranked 1970 Plymouth Barracuda better. "Lower production numbers make the Cuda a better investment." Would Buy Ranked 1970 Plymouth Barracuda better. Beautiful Work From Mopar — Dangerously fast car for some who never drove a car with 500 hp. Safe to say it is easy to get into trouble with this one. But it is a blast to drive. It may be on the auction block in the near future. Pros: Runs like a bat out of hell. Dream Car That Is Reliable, Stylish And Somewhat Attainable — My 1970 Challenger is a basic small block version but still packs in tons of fun!!. 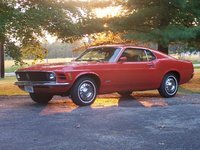 Most older muscle cars have great brawn reputations but lack in the handling department. I upgraded my E-body Challenger with Hotchkis Total Suspension that literally transformed my car. It is now a world class handling machine that circles the skid pad at .93g. The new SRT8 Challenger can only manage .84g. Aside from the suspension upgrades, my car is pretty much stock. It is reliable, tough and very attractive. It's the ultimate muscle car. Challenger T/a — My first car when I turned 16. Bought it in April of 1997 and still have it. Original numbers matching car with 35,000 miles. (32k when bought in 97') Only driven for fun a leisure, multiple national show winner and featured in several magazine articles over the years. Very rare, very flashy and very fast muscle car. Dodge '70. — Well... as muscle cars go, this one is quite unique. Lots of power and torque. Has a really solid frame. Interior needs work but exterior is really beautiful. Drag racing this thing is good stuff. Its a gas guzzler though. Dodge Challenger R/t — Dodge Challenger R/T 383 magnum original but it got a 451 stroke now, with edelbrock performance cylinder heads. Holly dp 850 carburator and a prepped 727 aut transmission . I have restored it with my dad, the car is nearly in new condition. Pros: Strong, Awesome looks. Great ride. Cons: I dont have enough time to get things done on it. My First Car — One of the most beautiful cars ever built, but unless you had a big block engine or a Hemi, it wasn't a really fast car. Suspension was stiff and the mileage was terrible. But this is a beautiful body, who wouldn't want it.